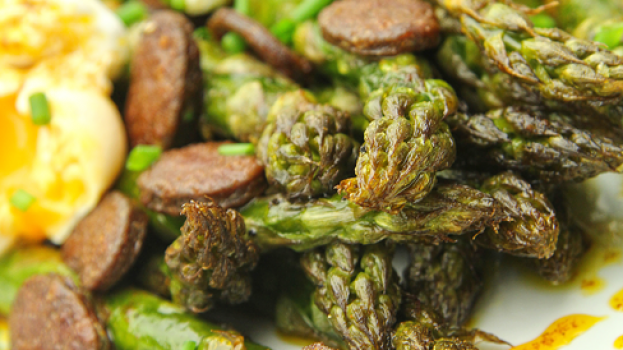 Place the asparagus into a roasting dish, add 1 tablespoon of the olive oil and place in the oven for 10-12 minutes. In a warm frying pan add 1 tablespoon olive oil and add the slices of chorizo. Warm them through for about 2 minutes then stir in the paprika. Meanwhile place a pan of boiling water on the hob and bring to a fast rolling boil. When you have 3 minutes to go before serving crack your two eggs into the boiling water and immediately lower the heat to low-medium for 2 minutes. Then turn the heat off completely. Remove the asparagus from the oven and place on a serving dish, sprinkle over the hot chorizo slices, and with a slotted spoon add the two poached eggs. Finally drizzle over the paprika oil and finish with the chives.